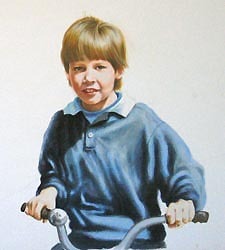 Portrait of the Boy. Mikhail Sazhaev. 1997, graphic arts: paper, different materials, 39x45 cm (15 1/4"x17 3/4"). 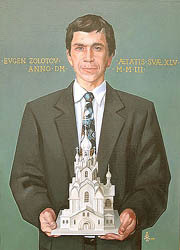 Portrait of architect Evgen Zolotov. Alexei Lopato. 2002, oil painting: oil on canvas, 50x70 cm (19 3/4"x27 1/2"). Portrait of writer Sergey Tokarev. Alexei Lopato. 2003, oil painting: oil on canvas, 41x71 cm (16 1/4"x27 3/4"). Salvador Dali portrait. Alexei Lopato. 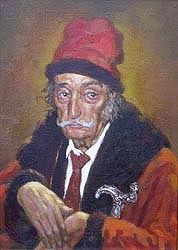 2003, oil painting: oil on canvas, 37x52 cm (14 1/2"x20 1/2").